I agree, I'd like to see more infill/density near downtown, rather than more parking lots. I saw the headline the other day and began reading the article with a lot of interest. But the article itself doesn't seem to say too much, other than mentioning LCC tabled any purchase decision until later. I would like to see any future LCC expansion (thinking academic buildings/residence halls) kept near downtown rather than out at the westside campus, etc. But as you note, sounds like it will be a long time before LCC builds anything significant on that land. Short term - parking lot. Long term - hopeful. LCC in the past decade has put so many holes around its campus. They saved the old Carnegie Library and built the attached University Center. But, beyond that, every other "development" has been a surface parking lot. Given that, they have more than enough land on which to expand if they ever do to not require us to hand them over another block. Whoever is guiding their development seems to think of LCC as an island in downtown instead of an integrated urban campus, and that worries me, a lot. They leveled Old Main for a parking lot. They leveled the northwest corner of Capitol and Capitol for a parking lot. They want to level the southwest corner for an open-space "entrance" to campus, whatever that means. And, trust me. We give them Oliver Towers, and they'll do nothing more than expand the lot on the northern half of the block into the southern end. Looks like the property is back on the market after LCC's option to buy it lapsed, last month. What makes this time different is that the city has now put up a big for sale banner on the towers. The article says it's been appraised by the Feds at over $1 million, though, how much the city is looking for it, now, I'm not sure. Regardless, given the location so close to the capitol, this property remains a steal if someone's going to take the chance. Eyde officials have said in early conversations they don’t plan to tear down the building, but rather gut the interior and refurbish the outside. Eyde will have one year from the sale’s closing date to start the project or the city has the option to rescind the deal. IF the Towers are not demolished, I like the sense that the vertical height/density will be maintained. In other words, I don't think any new building on that site would be as tall (4-5 story mixed used development - though that would not be a bad thing either). Not sure how much work (smoke damage) the current building has? I'm assuming any redevelopment would have commercial on floors 1-2 and residential apt/condos on the upper floors? Yeah I'd agree. If they keep Oliver Towers, it would make for decent student housing. I just hope that they would do some major upgrades for the facade and construct a liner building a couple floors tall with first floor retail as you said. I forget, did LCC buy the adjacent parking lot or does the City still own it? The city council approved the sell of the towers to the Eyde's, last night. LANSING – The Lansing City Council has OK’d the sale of a long-vacant apartment building to a family-owned development team. 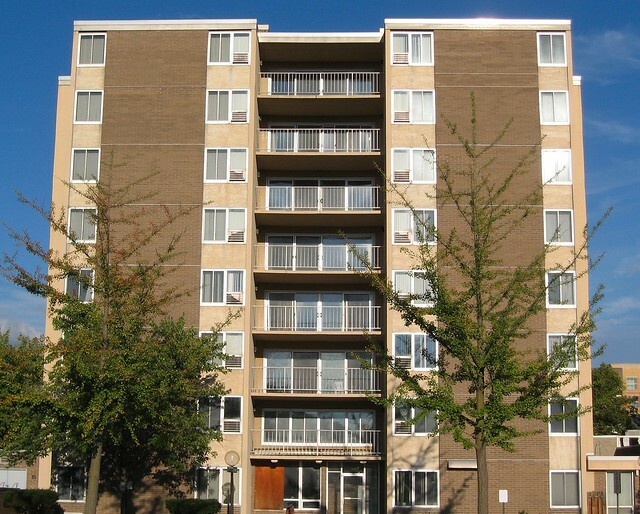 Council members on Monday voted unanimously to approve the sale of the former Oliver Towers to the George F. Eyde Family LLC, an affiliate of Meridian Township-based Eyde Co. The company will buy the city-owned building for its appraised value of $1.05 million. Company officials have said they do not have a development plan for the property but are considering a mixed-use project that could include retail, office and residential space. Eyde officials have indicated they plan to gut the building and refurbish the outside instead of demolishing it and starting over, a city official said. The company will have a year from the sale's closing date to start the project or the city has the option to rescind the deal. Update on the Oliver Towers project. The Eydes are planning on doing a redevelopment of the building with commercial and office on the first floor and 100 apartments on the upper 7 floors. Current news reports are saying that they are planning "European-style" apartments (read: small), and the renovation will include a reconstruction of the building's faced. The apartments will be one-and-two bedrooms from 400 to 800 square feet. They are also considering building out the storefronts to Capitol Avenue. The Eydes are planning on spending $8 million on the redevelopment, and are going to request brownfield credits so there will be some delay before work can begin until the credits are awarded and the development plan gets approval from the city council. BTW, I went and looked up the firm doing the redesign, Barberini & Gunnell. They are a modern Italian firm that did design work on the Knapp Center renovation. I was just thinking about this project last week, and thinking it had died...and then this. The Oliver Towers apartment building in downtown Lansing will finally get a revamp after sitting mostly vacant for more than 17 years. The eight-story building at 310 N. Seymour Ave. was damaged by a fire in 2000, but a local developer plans to complete renovations on the long-empty structure by the end of next year. 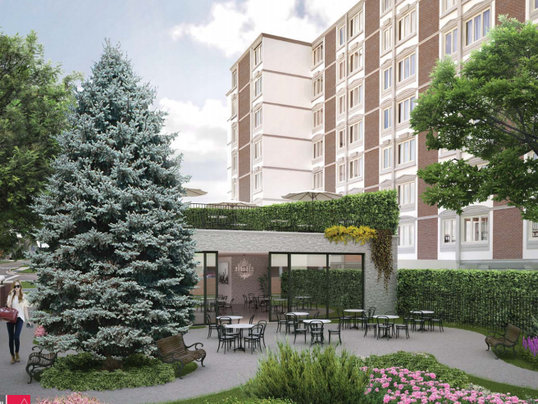 A $13.7 million redevelopment project will include 4,430 square feet of office and retail space on the first floor and 103 "micro-style" apartment units, as well as improvements to the building's facade and courtyard. After securing incentives from the state this week, the project's developer — The George F. Eyde Family LLC — plans to start interior tear-out and environmental remediation in the next few days, said Mark Clouse, the chief financial officer and general counsel for the Eyde Company. The renovation is tentatively scheduled for December 2018. I think this is the first mention of ground floor office and retail space? I'm very excited about that, because that area needs more retail space.